This pasta goes perfectly with some grilled chicken and veggies for full meal. I have been making a ton of caprese/bruschetta recipes lately or rather ones that use the same flavors because I think I've finally convinced Nick to eat tomatoes. Like he has even been asking for tomatoes on tacos! YES!! This one is probably the highest up on the list of things I've made recently with the tomato, basil, mozzarella combination. It could be eaten by itself as a meatless dinner, but we paired ours with some seasoned grilled chicken and asparagus. Honestly, the grape tomatoes are my absolute favorite in this. They give you that little burst of juiciness. It's wonderful with the gooey, melty mozzarella! Corn on the grill is good by itself, but is even better with garlic butter and lime! Today's reveal day is a themed reveal day since it's the 5th Monday of the month. It only happens every once in a while, so we are taking advantage of it and having a PICNICS AND BBQ reveal day today! All of the recipes will be perfect for the summer season. I was assigned to Amy's blog: Amy's Cooking Adventures. Amy is a married mom of two boys and an angel baby girl. I didn't know this about Amy until I read her about me, but she didn't really get into cooking until her oldest boy was eating table food. She posts such amazing food all the time and is incredibly talented at cookie and cake decorating - I had no idea that she wasn't a "Susie Homemaker" from the get-go. She's also our SRC pinner and is almost always the first person to jump in and adopt an orphaned blog. I was really pumped to get her blog and knew I would have no problems finding a great recipe or two to make. I narrowed my list down to three contenders: Grilled Corn with Garlic Butter & Lime, Lemon Cream Pie, and Roasted Brussels Sprouts & Cauliflower with Bacon. I really really really wanted to make the brussels but we ended up doing a grilling family dinner one weekend and I figured my best bet was the corn. I am disappointed that I didn't go with the lemon cream pie because that was going to be the "stepping out of my comfort zone" recipe. I don't really make lemon desserts ever. But I used to not make savory dishes with lemon either. So grilled corn happened!! Corn on the cob on the grill is one of my all-time favorite things and I knew this recipe would be a keeper. I sent Nick to the store to grab the ingredients and when he got home, I realized there were no fresh chives. Apparently, someone thought chives and green onions were the same plant. So a google war began and I was right (duh! ), green onions and chives are not the same plant. I think he was thinking scallions and green onions. We did use a little freeze-dried chives in the recipe, but I would love to try fresh chives next time we make it. The garlic butter was amazing, as was the Parmesan cheese, and the lime really just added the perfect kick of flavor to the corn. We were all in love with this recipe! The most magnificent summer treat in a pan - perfect for potlucks or get-togethers! This week's Sunday Supper event is SUMMER'S BEST POTLUCK DISHES and is hosted by T.R. of Gluten Free Crumbly. I made these dumplings last summer for a family grill out (which is like feeding a small army anyways) and thought it would be the perfect recipe to share with y'all today for the summer potluck event. So it literally could not be written in the stars any clearer than this recipe that Ree Drummond and I should be best friends. I love all of her recipes and she never fails me. However, I decided to switch up her apple dumplings with peaches - and then later noticed the side note where she suggests peach, pear or apricots would work well. I am the worst at actually reading through my cookbooks. Anyways, I was going through my blog feed and saw Peach Dumplings pop up and noticed they were from Ree and decided it's totally fate that she would post her adaptation so close to when I had planned on posting the adaptation of her original recipe. However, in her adaptation, she used frozen peaches and Sprite, whereas I used fresh peaches and Mountain Dew. I'm definitely taking a page from her book (hah, puns!) and using frozen peaches next time because the fresh peaches were a pain in the backside to deal with. Ree suggested serving it up with vanilla or cinnamon ice cream. We did cinnamon bun ice cream and I have to say - GO THAT ROUTE!! The whole thing is heaven in your mouth. By far, these dumplings are one of my all-time favorite desserts and recipes! Soft peanut butter cookies with chocolate chips and Reese's cup bits throughout! I adore peanut butter cookies. My mom made them a lot when I was little and I always got to help make the little markings on the top with a fork. As an adult, I am still on the hunt for the perfect classic peanut butter cookie. However, I get distracted into finding recipes like this one where it's not just a plain peanut butter cookie. Side note: if you have a go-to peanut butter cookie recipe, I would be forever grateful if you commented and shared a link! I found these cookies and couldn't pass up making them because I am a sucker for chocolate chip cookies and I loved the addition of Reese's cups. I tried to place a few on them after the oven and they didn't really stay and they were kind of messy, so my chopped cups went into the cookie dough and that result was much better for me! Simple ingredients often make the best meal. This chicken is topped with ooey gooey fresh mozzarella and a wonderful homemade bruschetta. I am digging grape tomatoes lately. I am digging them in like everything. I finally convinced my family that they are delicious too and it makes me so happy that I can fix things with them in it now. This recipe takes a very simple set of ingredients and little effort to make. The chicken and bruschetta marinate separately for a few hours and then all you have to do is pop the chicken into the oven and in the last few minutes, top it with the cheese. You serve the warm, cheesy chicken with the wonderful, lovely bruschetta. It's just a match made in heaven. No joke. I love a good chicken salad, but this one beats them all with its homemade cilantro lime dressing! Lately, I feel like I'm getting more adventurous with foods. I'm more willing to try new things and even if it's something I'm sure I won't like, I will try it anyways. I recently tried Vegemite. I wasn't sure how I'd feel about that. But I did without hesitation, so that I could say...yes, I have tried it. I didn't like it LOL. I am proud that I did try it and can say that I have though. Salad dressings are one of the foods that I am fairly picky about. As a child, I only would eat Catalina. Then as I got older, I was okay with French dressing and Thousand Island. Now I have branched out and will eat Caesar, southwest or chipotle ranch, poppyseed, vidalia and citrus vinaigrette, and more...I don't eat every single one of them, but I'm branching out. So when I saw this one had a homemade cilantro lime dressing, I knew I would have to try it. I was so glad that I did! The cilantro lime dressing is cool to the kick from the chicken and is perfect in this salad. Y'all have got to try this recipe!! This pasta dish is cooked in one pot and is served with a special crunchy topping! I am so happy to finally be sharing this recipe - partly due to the fact that if I'm stuck meal planning, I will jump over to my blog's recipe index to find something to make. I often forget about recipes waiting to be posted until then, so YES!! This one is going to be added to the index and it will now be something I remember making when I need a chicken recipe or a pasta recipe! This recipe looks incredible plated, but the flavors are what really blew me away. The bread crumb topping is the perfect crunch to go with the softer textures of the pasta and tomatoes and spinach. It's crazy to already be past the halfway point in May. My older two kiddos are going to be out of school this week and I don't think I'm prepared yet. Spring break gave me a taste of what summer will be like and I feel like I'm gonna need a whole lotta wine to get through summer break (just kidding!). I'm hoping to let go of some of my control freakness and let them help in the kitchen a lot this summer and hopefully also get out of the house and do some fun stuff! Group D kept getting smaller and smaller and the other groups were also starting to shrink, so we decided it was time to go back to 3 groups until we need the 4th group again. With that shift, I moved to Group C and also took over the hostess duties for Debbi, who has been very busy lately - so it worked out well for both of us! I'm very excited to get a new set of bloggers to visit and feature for reveal days. 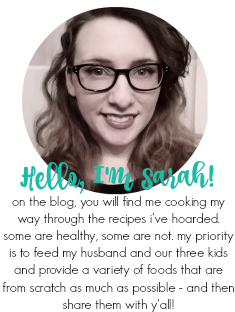 This month, I was assigned to Group C member, Sara. She blogs at Cook With Sara - let me just say that I have had the hardest time making sure I didn't add the "h" at the end. Sara - do Saras without the "h" refer to it as the right way to spell it? Because that's what I always do - Sarah with an "h" is the right way :P I digress, Sara describes herself as a Midwestern girl with a love for food and cooking. She learned how to cook and bake from a young age from her mom and focuses on making old and new recipes with mostly every day ingredients. And I love that! I knew from the get-go that I would have no trouble finding a recipe to make on Sara's blog. I decided upon the Cherry Cheesecake Frozen Yogurt because I love frozen yogurt and have only made a few recipes. Two, if I remember correctly. I definitely went the sweets route when looking for recipes, so before I talk about the froyo, let me discuss the other recipes I almost made. Prepare yourselves because this is about to be a lot of recipes. I saved Pineapple Sorbet, Caramel Toffee Crunch Cheesecake, Caramel Macchiato Cheesecake, White Chocolate and Macadamia Blondies, Peach Cobbler Bars, Cookie Butter Blondies with White Chocolate Chips, Butterscotch Cashew Bars, Carrot Quick Bread with Cream Cheese Frosting, Peach Cobbler Coffeecake, Blueberry Oatmeal Bread, Bananas Foster Bread, Lucky Charms Chex Mix, and Blackberry Rhubarb Bread. As you can see, I had a hard time choosing a recipe...like a really hard time. But since I had only made froyo twice, I had to make her froyo! Best decision ever!! I only made some slight adjustments. Instead of plain yogurt, I used vanilla yogurt and I couldn't find any fresh cherries, so I resorted to a mix of frozen, pitted cherries from Kroger's Private Selection brand. I thawed them a little bit and then chopped them. I had no problem with the recipe with those adjustments and I froze it overnight. It was so lovely. It literally tasted just like cherry cheesecake. It was super rich though, so you can't really overindulge on it even though it's a little healthier than ice cream. It got huge thumbs up from everyone in the family. You would never know it was frozen yogurt, so it could definitely trick a few folks who may think froyo sounds weird. I'm convinced it could turn a froyo hater (if that is such a thing) into a froyo lover!! :) Thanks, Sara, for the awesome recipe. I cannot wait to try more of the recipes on your blog! Hello again! I've decided to start getting back into regular TBT posting. My goal is two a month and I definitely think that is feasible. That's the same for Fantastical Fridays which I haven't posted in literally forever. No need to pick between the two - these Chicken Fajita Quesadillas are fabulous! I love fusions of different cuisines and find them just plain fascinating, but I love fusions of the same cuisine together too. I recently tried a quesadilla/burrito combo (quesaritos, anyone?!) and that was just too amazing, so I figured it wouldn't hurt to try a combination of fajitas and quesadillas. It's a little on the safer side of making a combination of two things. Really it's only slightly different to make it a quesadilla rather than just serve it up as a fajita, but you definitely don't want to underestimate this one. It's also one of the few quesadillas I've had reheated that I liked. We made a bunch and even sent one home with my sister-in-law for her to eat the next day for dinner. It's kind of the fun part about living so close to the family - we are constantly having dinner guests and it works out really well for us because 1) we get to see our family A LOT (and we love that after 8 years away) and 2) we always have leftovers and can pawn them off on family members! We usually take home leftovers from weekly family dinner at my mom-in-law's, so there are always tupperware containers spread across a couple places and we just keep them going around LOL. Anyways, y'all have to try this yummy combination of fajita and quesadilla. It's not a very time-consuming dish and it doesn't take a lot of effort and the end result is magic! There is nothing better than a hearty meal made in one pot in under 30 minutes like this one! The food blogging world goes through a lot of trends. I can't say I hate it though. I actually love it because it just encourages me to hoard a bunch of similar (but sometimes completely different) recipes. You know, ones that fit into one particular category but aren't the same thing? I know I sound super confusing, but let me clarify...I love when the food blogging world started honing in on everyone's love of one pot meals. Tons of one pot meals starting popping up all over the place and I went crazy pinning them all to try. That's what I mean by a bunch of similar recipes...in the same category, but all fairly different from one another. This recipe title literally has everything I like in the title..."One Pot" - sold. "Cheesy" - sold. "Pasta" - sold. "Sausage" - you guessed it, sold! I'm even a bandwagon ampersand lover. They are just so pretty, right?! Tell me I'm not alone over here with the ampersands! Anyways...a lot of my favorite one pot recipes are pasta based and this one also includes fresh tomatoes and basil. LOTS OF IT. Just the way I like it! It was a very delicious meal and I really hope that y'all try it out! It's a life saver to be dirtying one dish and made in under 30 minutes. Ah, another wonderful Monday morning...let's hope that isn't laced with sarcasm! It's always nice when a Monday goes well. This week contains Nick's birthday and I told him I would make Little Nicky's Burgers for him because they are his favorite. This time I am doing schnitzel instead of Popeye's chicken...we may have to rename them though. Ignore all the question marks - I'm not quite sure what I have on hand and don't really figure that out until like 10 minutes before I leave to grocery shop. This copycat burger packs a punch because not only is it topped with sliced jalapenos - it has jalapeno poppers and salsa con queso on it too! This week's Sunday Supper Movement event is SPICE IS NICE AND SOME LIKE IT HOT hosted by Sarah of The Chef Next Door. I have this obsession with making copycat recipes. They are so much fun to come up with and it definitely opens some doors for foods that are only found in certain regions that I cannot obviously get to in time for dinner any given night. This recipe is a copycat for a Jack in the Box burger. I think I had seen a picture in a round up of the best spicy restaurant foods or something like that. Maybe a cheesy food round up. I'm not sure. I wrote down what all went into the burger and it was as easy as that! Instead of doing a cheese sauce with taco sauce, I chose to sub in salsa con queso. It was absolutely the right decision! This was a fabulous burger with lots of heat. Definitely fits the name "Hella-peno". Jalapeno poppers (the frozen kind) are very dear to me. Don't laugh, y'all, dead serious here. They were something Nick and I ate a ton for many many years. It was definitely our go-to snack for our at-home date nights after the kids were in bed. They are so nostalgic and I loved the idea of putting them onto a burger. I hope y'all give this recipe a try and don't hate me too much for your demolished taste buds - haha! Fluffy waffles topped with a mixed berry sauce, whipped cream, chocolate, and macadamia nuts! I adore using my waffle iron, but unfortunately I don't use it as often as I'd like. It's kind of one of those things where I've been on a mission to utilize everything in my kitchen as regularly as possible. We just recently started going through the boxes in our basement from our move in the end of 2014 and we're finding all sorts of goodies down there. Like my mini springform pan, my bread pan, and a few other kitchen goodies. Anyways, my waffle iron is easily one of my favorite kitchen tools. It doesn't take long to heat and batter never takes long to make for it. Cooking time is quick, too. It's literally so easy to make waffles...so so easy. I have had this recipe hoarded for many-a-years...like since Ashton of Something Swanky posted it in 2012. Her blog has been one of my favorites for a very long time. I don't think I can recall a time where a recipe of hers has failed me and I trusted that this one would be no different. The waffles are so fluffy and I loved the idea of a berry sauce on top instead of syrup. Fun fact: I hate the smell of maple syrup and I will only put enough on my waffles/pancakes/French toast to taste. I hate any excess. I also hate that it's sticky. I actually had a similar waffle at a hotel continental breakfast a few weekends ago and it reminded me of how much I really want to make these again. The chocolate chips and macadamia nuts add richness and crunch for an overall wonderful breakfast or brinner! A dish that turns regular chicken into an exquisite, beautiful, and delicious meal. This dish definitely has a fancy factor...prosciutto and Gruyere stuffed into a flattened chicken breast and served up cut into these gorgeous little slices. It looks like something you would get at a formal sit-down restaurant. Right?! But thankfully it is incredibly easy to make, even for me - I hate making stuffed chicken! The presentation alone makes these worth making, but it really wasn't as bad as I had expected. The salty prosciutto and rich Gruyere perfectly complimented the chicken. It was fabulous with a side salad and broccoli and will definitely be one I make again. I would love to try a couple different cheeses as well! Good morning, everyone! I struggled to meal plan this week for no reason at all, so I'm still trying to get my grocery list made. This week I'm going to try and make the parfait that I've been meaning to make for literally a year. I'm also making a few old favorites (Tues and Fri) and making a few that I forgot to get pictures for. I'm also making a few recipes out of some cookbooks that will be linked below (using affiliate links to Amazon). This weekend is a little bare on Saturday, but I'm also very excited for it because we are celebrating my soon-to-be brother-in-law's birthday (which is actually today) and Nick's birthday (which is the 14th, but he has drill that day). I decided to go with Vanilla Chai Cupcakes for them because Nick (BIL) was a Marine and, as most of you know, Nick (my husband) was in the Army, so they have bonded over their deployment go-juice: Green Beans! They both really loved the Chai Tea Lattes and Smoothies, so I figured this would be a perfect fit for the two of them :) I've written about it a lot with recipes, but it's my mission to pick something awesome and catered to the birthday person to surprise them! Rich chocolate cake with red wine infused chocolate frosting to top it all off! Today's Sunday Supper event is dedicated to all the mommas out there! Our theme is MOM'S FAVORITE RECIPES and is hosted by Christie of A Kitchen Hoor's Adventures and Wendy of Wholistic Woman. You will find recipes that are ones our moms made OR ones that our moms love to eat. I am very blessed to have not only a wonderful mom, but a wonderful mother-in-law. She took me under her wing from day one and I can always count on her for advice and she is one of the most giving and selfless people I know. Her birthday is on December 30th and I know that has probably been a bit hard over the years because it's so close to Christmas and she puts everyone before herself. It has always been a priority to me to put a lot of thought into celebrating her birthday since joining the family. I've made red velvet cheesecake, German chocolate cake, piggy cupcakes, and dark chocolate cappuccino cupcakes in past years. 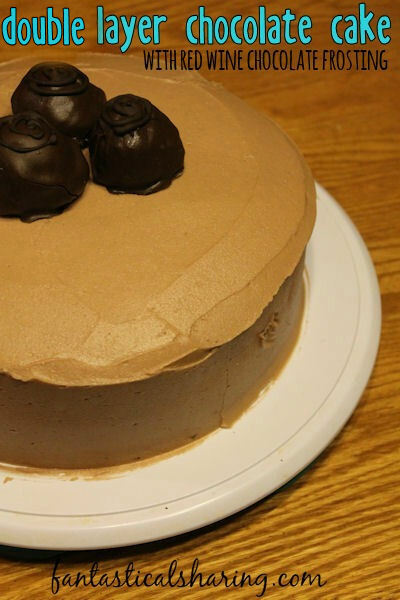 This past year I was going to make red wine chocolate bonbons for her to be able to take home and went on the hunt to find a cake that would go well with the bonbons. My mom-in-law loves her wine, so I wanted to put a little wine in the cake somehow. I went to Sally's (of Sally's Baking Addiction) blog and found a beautiful triple chocolate cake that I knew would be the perfect base since it had coffee in it - if ever a cake could make a woman happy, it's one with coffee, chocolate, and wine - am I right?! I did a little more hunting and found a sangria cupcake recipe. The buttercream frosting used a red wine reduction syrup, but I wanted to have red wine chocolate frosting and so I did a little more hunting and found how to make a red wine dark chocolate sauce. I replaced the red wine syrup with red wine dark chocolate sauce and the frosting turned out wonderfully. Honestly, I could eat the red wine chocolate sauce with a spoon. It's so rich and decadent. Even though this was a long process, it was definitely a labor of love. I was very happy that she loved the cake (and the bonbons) and I'm already hunting for a new recipe to make her this year for her birthday - I'm sure it'll be hard to top this one!